My five year old son thinks muffins are cupcakes and who am I to crush his dreams? He's been asking for "cupcakes" the last few days so today, I decided to whip up some super easy & healthy gluten free banana chocolate chip muffins for an after school snack. 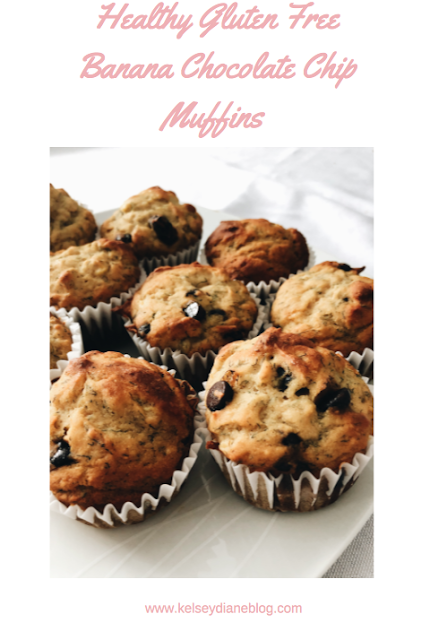 What I love about these muffins is that there's no refined sugar in these muffins at all. They get their sweetness from the bananas, honey and apple sauce. I won't waste anymore time talking to you guys, lets get straight to the recipe! Fill muffin tin with liners. In a bowl, mix flour, baking soda & salt. In a separate bowl, mix bananas, honey, vanilla, oil, egg, milk and apple sauce until well blended. Divide batter into muffin liners. Bake for 20 minutes or until a tooth pick comes out clean.